According to the Census, there are five kinds of families in Canada: married with children, married without children, common-law with children, common-law without children and lone-parent. Findings from the 2006 Census suggest that the structure of Canadian families is evolving. In 2006, 39% of Census families were married with children compared to 41% in 2001. 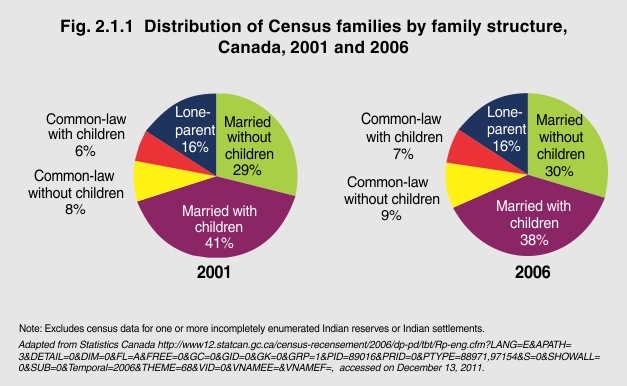 In 2006, 7% of Census families were common-law couples with children compared to 6% in 2001. Thus, the proportion of all Canadian families who are married families with children is declining while the proportion of common-law families with children is increasing. With more children living in non-traditional arrangements, the way Canada defines a family must be socially sensitive and sufficiently broad to encapsulate present-day family structures. Beyond that, there needs to be an appreciation that not all families function in the same way or are equally privileged. By recognizing the disparities and struggles that are common to specific family types (e.g., lower incomes among female lone-parent families), we can begin to redress these inequalities and, in doing so, lessen the toll on the family unit and the children affected.